Neal Pionk scored the tiebreaking goal on a sensational, end-to-end rush late in the third period and the New York Rangers rallied to beat the Montreal Canadiens 5-3 on Tuesday night for their fourth straight win. Neal Pionk couldn't ever remember scoring on an end-to-end rush before. The 23-year-old defenceman got the tiebreaking goal on a sensational individual effort late in the third period, and the New York Rangers rallied to beat the Montreal Canadiens 5-3 Tuesday night for their fourth straight victory. "That was a good one," Pionk said. He brought the puck from behind the Rangers net, spun around one Montreal player, skated up the left side, cut in toward the front of the Canadiens net and put it past goalie Carey Price while falling to the ice with 2:44 left. "I couldn't believe it," teammate Mika Zibanejad said. "I told him he doesn't need us out there. He's such a good skater, it's incredible to see." Zibanejad and Chris Kreider each had a goal and an assist, Tony DeAngelo and Pavel Buchnevich also scored, and Kevin Hayes had three assists for the Rangers. Henrik Lundqvist made 31 saves. New York trailed 3-1 early in the second period before scoring the last four goals — three in the third. "Real gutsy win," Zibanejad said. "We weren't real happy going into the third but felt we had a little bit of momentum and we just wanted to keep that going. We did a lot of good things, and a good feeling to win." Zibanejad capped the scoring after he brought the puck up the left side and tried to send a pass across in front. The puck defected back to him off Jeff Petry's skate and Zibanejad put it past Price with 1:48 to go. Tomas Tatar had two goals and Max Domi also scored for Montreal, which was 7-3-1 in its last 11 games — including a shootout win across town against the Islanders the previous night. Brendan Gallagher and Petry each had two assists, and Price stopped 27 shots. "We made a lot of mistakes," Canadiens coach Claude Julien said. "As a group, we weren't very good. We couldn't have been that tired. We had a 3-1 lead. This happens to every team." 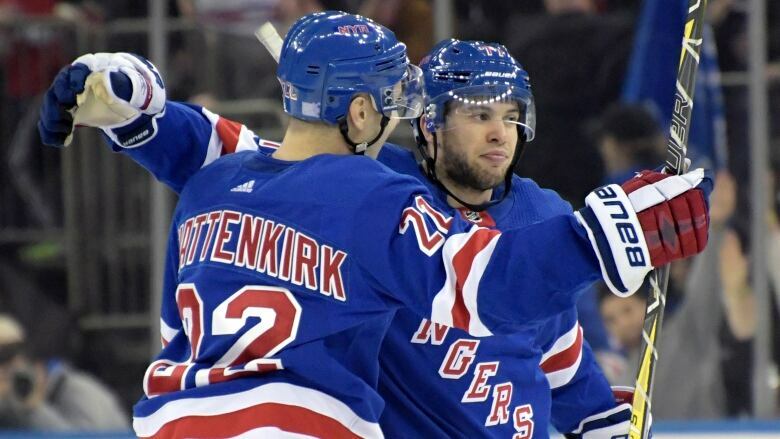 The Rangers began their comeback late in the middle period. Just after New York's power play expired, DeAngelo tipped a shot by Hayes for his second goal with 2:15 left to make it 3-2. "I thought that gave us a little bit of a lift," Rangers coach David Quinn said. "To play the way we did in the third ... it makes you feel pretty good."